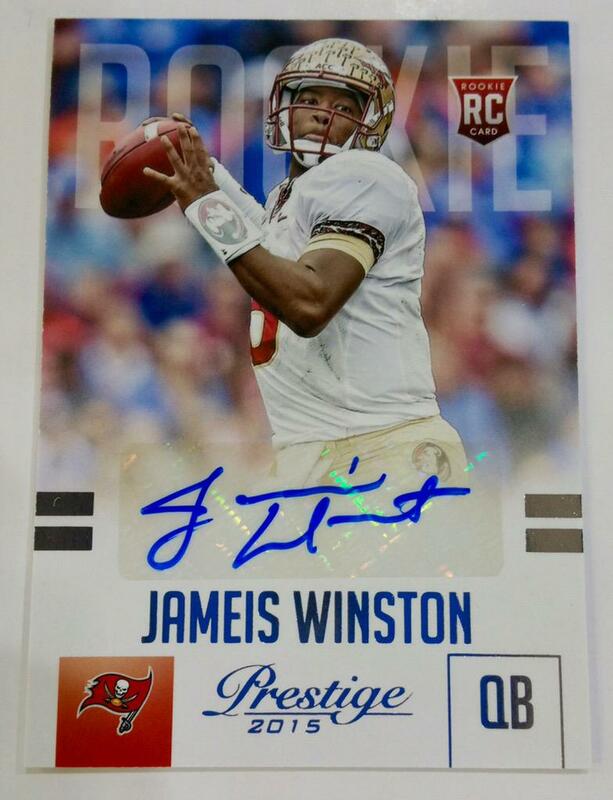 2015 Panini Prestige Football arrives Wednesday ($85 per box) with 3 Autographs and 1 Rookie Jumbo Jersey Patch in every box. New for this year, all the top rookies will be included in a set called "Rookie Premier Next Day Autographs" with On-Card Autos. The Rookies will get a full-bleed photo with four types of parallels, all limited to no more than 100 serial-numbered copies. The Rookies also will have a heavy autograph content. 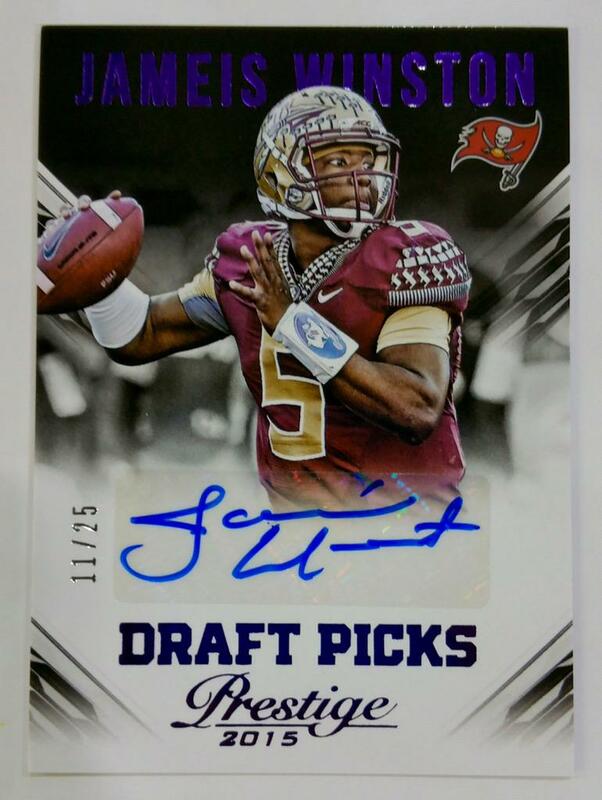 There will be Rookie Signatures autos as well as First Impressions autos that will be limited to no more than 99 copies. Jumbo draft pick box-toppers will return one per box, while other inserts will include Super Bowl Heroes, Franchise Favorites (a diecut acetate set), Road to the NFL and Veteran Autographs. 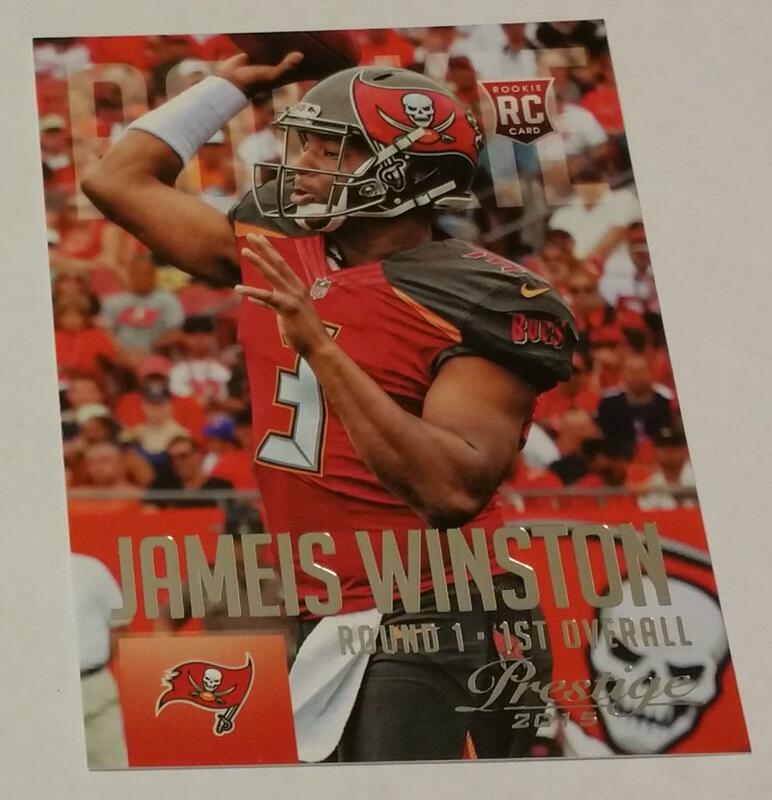 Other inserts include NFL Shields, Draft Big Board, Blue-Chip Recruits, Draft Picks and Prestigious Picks. Acetate inserts will include All-Americans and Campus Legends. Each box will average 24 Rookie Cards, four rookie photo variation cards, and a mix of 13 other inserts. So go to Sports Cards Plus, a.k.a. The Super Hit Factory on Wednesday and pick your box from The BEST CASES in The Hobby at The LOWEST Price in The Galaxy (all of Texas). Don't be the guy who says, "That could have been my picture."